While I mostly refrain from writing about celebrity weddings. There are some weddings that you just can’t ignore. Enter Priyanka Chopra. Not only is her fashion sense always on point. She has an incredible personality that just keeps drawing you in and in. Since last few days, Priyanka Chopra’s Pre-Wedding Bash pictures are all over the internet. It’ll take you to be a stone to not melt by looking at the cutesy pictures and videos. It should come as no surprise that I am totally stalking Priyanka Chopra this month. Her Instagram photos and stories are just so entertaining. From the amazing camaraderie she shares with her famous sister in law Sophie Turner, to the bridal squad pictures she shares with all her followers. It gives you a tiny insight into her personal life. Priyanka Chopra’s dress was a strapless ivory cocktail with draped satin faced organza bodice, ivory thread work and feather texture from the Spring/Summer 2018 Marchesa collection. There is absolutely nothing to not love about this dress. The features, the tight body-con look, and those killer sky high heels. My only concern was how on earth did she dance the night with those heels on. But that said, just look at how stunning the whole ensemble looks. 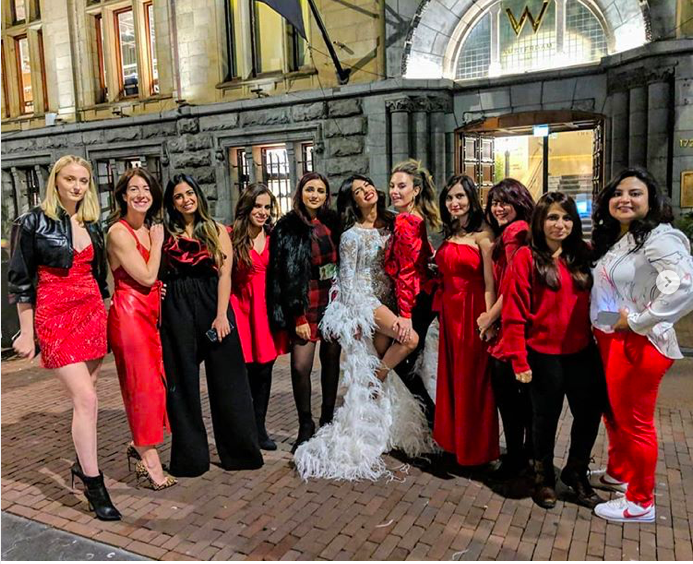 For her Bachelorette, Priyanka Chopra and her entire bridal squad flew down to Amsterdam. Priyanka Chopra wore a Georges Chakra dress that looked straight out of the lookbook of Victoria Secret Angels. The dress was a long sleeve beaded cocktail dress with feather detailing and long sleeved feather duster from the Georges Chakra Couture 2018 Collection. Whose wedding are you more excited about? Deepika Ranveer’s or Priyanka Nick Jonas?